This year fall colors came in waves. 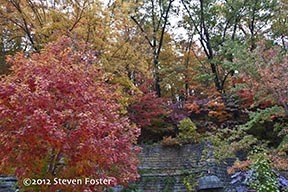 First a wave of glorious yellows and reds from Sugar Maples (Acer saccharum) planted around Eureka Springs, Arkansas. I couldn’t help but notice that the Sugar Maples planted along the sidewalk in front of the Best Western Eureka Inn at the top of Planer Hill showed their colors and dropped their leaves before the wild Sugar Maples in the forest directly across the street even began to turn color. Same for the Sugar Maples along Spring Street. Those planted along the street have dropped their yellow-orange leaves, while those in the adjacent woods have a glorious color display of orange to burgundy leaves, dominating the current color trend. So what is the difference between the colors and timing of the planted Sugar Maples and wild Sugar Maples? I suspect it is some type of genetic clock trigger. Which begs the question, how are autumn tree colors formed? There is no single, definitive answer to the question of why trees turn color. Much of our understanding is physiological. The major factor among a myriad of variables is the diminishing length of the autumn day, hence the amount of daylight. Production of chlorophyll ceases, and as the green chlorophyll degrades, sugars and anthocyanadins (the vast group of compounds responsible for color combinations of fruits, leaves and flowers) begin to dominate the leaves, aided by the variables of moisture and temperature changes. The recipe changes from year to year and species to species. This is convention wisdom. In the last 20 years an entirely new field of study—plant-animal interactions— hints of broader mechanisms, beyond mere physiological changes in the leaves. Fall colors are integrated in nature, signaling to fruit-loving animals and insects that fruits are ready for harvest, thus aid in seed dispersal. In some trees, the colors may send a signal to insect herbivores that feeding is over. The new science of autumn tree color suggests the process is a mix of defensive, seed-dispersing, signaling, and physiological functions all working in a symphonic display of intricate beauty. Our role in the process is simply to enjoy it. Thanks, Steven! I was wondering and the info about plant/animal interactions is fascinating. If only humans would stop and listen to the energy of nature… plant/animal and human. This is a wonderful gift Steven. Thank you.